The following ‘Singing for Health’ classes incorporate Singing for Breathing principles (they promote better lung health and are affiliated with the British Lung Foundation). 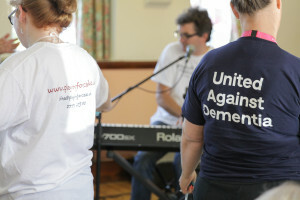 They are also affiliated with Sing to Beat Parkinson’s. Everyone welcome! North Walsham and Aylsham District Skylarks – 1st and 4th Wednesdays of each month. Sacred Heart Church Hall, Kings Arms Street, North Walsham NR28 9JP. 11am for tea/coffee, singing 11:30am until 12:30pm. Ukuleles! Learn to play the ukulele with this lovely, friendly and supportive group. Mondays (term-time) 4:30 – 5:30pm at The Tyneside Club in Sheringham (by the roundabout). For more information, contact us. £4 each. You can also pick up a programme from Sheringham Little Theatre’s box office. This is a lovely friendly and informal, drop-in session suitable for all ages, levels and abilities. You don’t need particular musical or singing experience to come along and join in the fun! This session is FREE to participants. 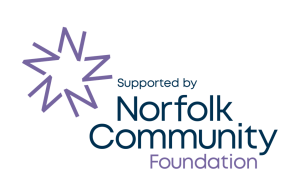 It is a joint project between Playing for Cake and Sheringham Little Theatre and this season’s programme has been funded by the Norfolk Community Foundation and Awards for All (The Big Lottery). Our next session at the Cameo Café (day care centre) in North Walsham will be at 1:30pm on 12th March 2019. Following sessions: Tuesdays April 30th and 28th May 2019, 1:30-2:30pm. Playing for Cake will be running a FREE community singing and music-making session on the afternoon of Monday 20th May, 2:00-3:30pm in the Spiegeltent in Chapelfield Gardens, Norwich as part of the Norfolk and Norwich Festival! Come and join in the fun! All ages and abilities welcome. Words/chord-sheets will be provided. No need to book but seats in the Spiegeltent available on a first-come, first-served basis. We are providing return transport (a coach with disabled access) from Sheringham and North Walsham for £8 return. Seats on a first-come, first-served basis. Please contact us to book and for pick-up times and details. We are hosting a FREE percussion-making workshop at St Peters Hall, Sheringham, from 2-4:30pm on Monday 5th August 2019 as part of Sheringham Carnival’s programme of events. The session will be suitable for all ages and abilities and include time for a singing and music-making session after the instruments are all made! Please help spread the word/come along and join in the fun. Instruments can be brought to the event below on Thursday 8th August! Playing for Cake will be running a FREE community singing and music-making session outside The Crown, Sheringham on the afternoon of Thursday 8th August 2019 as part of Sheringham carnival’s programme of events. We will also be running a percussion-making workshop earlier in the week – more details about these events soon! Come to the Playing for Cake Celidh on Sunday 20th October 2019, 3-6pm (venue to be confirmed but it’s likely to be held in or around Sheringham!). Live music with the fabulous Compass Moon, who will also lead the dancing. If you haven’t been to a Celidh before, it’s like a barn dance and great fun! If you don’t want to dance, come along and laugh at us and just enjoy the music etc. There will be a raffle and charity auction and refreshments will be on sale (bar and BBQ or hog roast, to be confirmed). More details soon! Sing Your Heart Out – Free singing workshops across Norfolk (Sheringham, Kings Lynn, Norwich, Attleborough and Gt Yarmouth). Singing Down Memory Lane – 3rd Thursday of the month – 3-4pm at The Lighthouse, Cromer Road, Sheringham. Friendly, supportive environment for singing with others/enjoying music. People with dementia and their carers especially welcome. Natasha Hood runs various singing sessions locally (North Norfolk). Visit her website here. Pilates and yoga (suitable for all levels and abilities), Sheringham Community Centre with Beth Lea. Drop-in meditation sessions, yoga and chair yoga with Helen Duncan.